Los Angeles (TADIAS) — Walking into the Mercado La Paloma on a Saturday evening, you feel an immediate tranquility from the busy streets of Downtown Los Angeles. The open space of Mercado La Paloma presents a line of eateries, with an unexpected new tenant nestled into one corner: Azla Ethiopian Vegan. Alongside the simple white countertops is a joint space labeled Azla+Tesh, filled with goodies ranging from jewelry to vinyl records to original stylish crop tees. As someone who has frequented Little Ethiopia in Los Angeles’ Fairfax District since childhood to indulge in Ethiopian cuisine and merchandise, pleasantly surprised is an understatement to describe this newest modern addition to the LA food scene. So who was the mastermind behind Azla? Needlessly to say, it was a family effort as Nesanet Teshager Abegaze tells Tadias Magazine. With mother Azla Mekonen as the head chef behind the vegan and gluten-free menu, and siblings Nesanet, Sonny, and Banchamlak Abegaze as the brains behind the lifestyle brand and boutique next door named Azla+Tesh. Nesanet runs the day-to-day operations, while Banchamlak, an attorney, handles the legal and financial aspects of Azla. Their brother Sonny Abegaze, a DJ and manager of the Ethio-jazz group Ethio-Cali, dons the title of “Chief Vibe Creator” curating merchandise and producing events. Together the powerhouse family has created not only nutritious vegan treats, but also an empowering space for Ethiopians and non-Ethiopians alike to come together around the concepts of wellness, health, and creativity. Nesanet’s journey to opening Azla first began after graduating from Stanford University with a degree in Human Biology. She soon began working for The New World Foundation in New York City, supporting non-profits advocating for environmental justice and workers rights among other causes. Nesanet’s work in the nonprofit sector took her to the South where she became increasingly involved in education policy. She went on to obtain a Masters at UCLA in science education, and began working at various schools, eventually becoming an assistant principal. However it was Banchamlak opening her own law firm that would shift Nesanet’s career from school administration to management. After a few years, one of Banch’s clients offered both sisters an opportunity to work at Atom Factory, an entertainment company. Nesanet served as Vice President of Operations for the creative division, managing campaigns including superstar Lady Gaga’s perfume line, Fame and clients like Barneys New York. Nesanet was able to explore her love of marketing and design and gain confidence in her creative skills. Combining her work experience with her passion in health and nutrition, Nesanet developed the concept of a contemporary, family-owned Ethiopian restaurant – Azla – that serves traditional Ethiopian vegan cuisine alongside modern artisan fare. Azla emphasizes supporting local, organic farmers and uses their produce in designing their menu. “Throughout all of my career transitions, the common denominator has been my love for food and wellness. It’s been a lifelong dream to create a space to share our family’s love of healthy cuisine, as well as Ethiopian art, fashion and culture. We are very excited to share the rich culinary and art/design tradition of Ethiopia with our customer base, which includes neighboring USC students and professors, downtown professionals, creatives, and members of Los Angeles’ thriving Ethiopian community,” Nesanet says. What also sets Azla’s menu apart is the incorporation of ingredients such as kale to a classic collard green (gomen) dish and making gluten-free injera to ensure not only taste but healthier food options, which is a vital aspect of Azla’s mission. 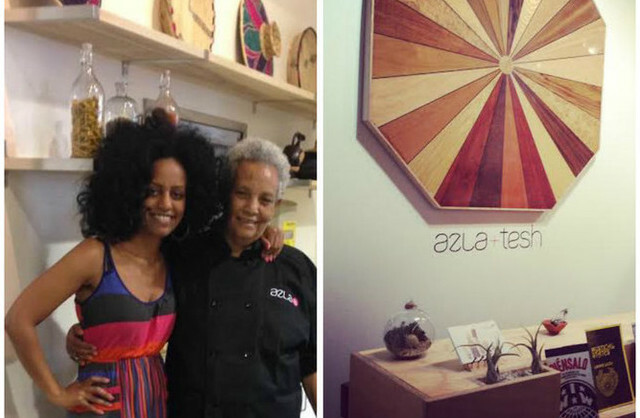 In addition to the cuisine at Azla, Azla+Tesh next door offers unique jewelry including colorful acrylic and wood Orthodox cross earrings, apparel including crop-tees and sweatshirts with graphics such as the Lalibela churches and a vintage Alemayehu Eshete album cover. Honoring timeless design elements from Ethiopia, while incorporating current fashion elements is the approach that the Abegaze siblings take in order to attract both Ethiopian and non-Ethiopian customers to the merchandise. “We’ve always been enchanted by Ethiopian crosses and the intricacy of their designs,” Nesanet shares. “We’ve worked to create jewelry that explores new materials such as acrylic and wood with pop colors to speak to a younger demographic.” The collection also includes necklaces with vintage bridal pendants and telsum beads from Ethiopia, using thicker bold chains, and a juxtaposition of modern and classic that guides the Azla+Tesh design aesthetic. In addition to accessories and clothing, Azla+Tesh offers old-school vinyl records, Ethiopian literature and films, and artisan food products that are packaged in beautiful mason jars. As for what the future has in store for Azla and Azla+Tesh, there will be a series of free monthly events for the community, including guest speakers in acupuncture and yoga, vegan supper clubs in collaboration with local vegan chefs, as well as musical performances and networking events. The Azla team is dedicated to providing customers with a wonderful dining experience, as well as inspiring a more healthful lifestyle by providing cooking tips, recipes, and cooking demonstrations. Sure enough, Azla is already making its mark in Los Angeles not only for its fresh and tasty vegan dishes, but by providing a new space for Ethiopians and Non-Ethiopians alike to indulge in history, fashion, music, and health all in one place. You can learn more about the restaurant at www.azlavegan.com and shop for Azla+Tesh products at www.azlaandtesh.com. Facebook, Twitter, Tumblr, and Soundcloud handles are @azlavegan and @azlaandtesh.